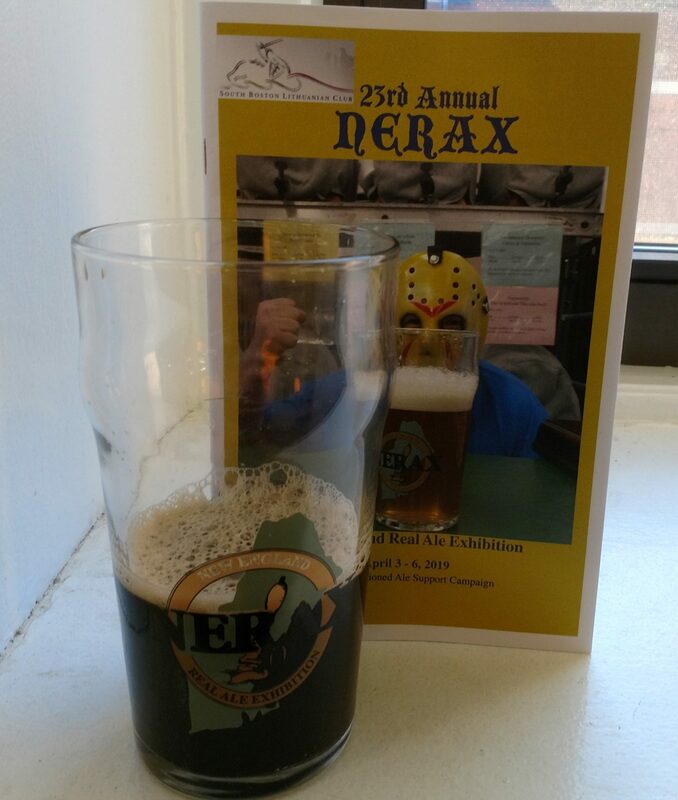 After a two year hiatus, I was finally able to make my way back to the annual New England Real Ale eXhibition (NERAX) festival in South Boston. Scheduled to feature over 100 different cask ales and ciders from a wide variety of US and UK breweries, this is a can’t miss event for aficionados of the format and any beer drinkers interested in trying something a bit different. It opened last night and has sessions running through Saturday, April 6 so definitely consider checking this out if you’re in the area. You can pre-order tickets here on the event website at a nice discount from the price at the door. I am a huge fan of this event and find it a lot more approachable than any other beer festival that I have been to. The pay as you go format and ability to order quarter, half, or full pints effectively put less emphasis on rapid consumption and chasing sample pours and more on actually tasting and appreciating the beer in your hand. It also makes for a much more laid back and relaxed atmosphere than your typical fest and I found myself really appreciating the difference. As an added bonus, the catering is provided by the long time NERAX supporters Redbones BBQ in Somerville, MA! From the US: Beer’d Brewing Company (Stonington, CT) – Dogs & Boats: A 9.1% Double IPA hopped with Citra and Mosaic with an addition of pomegranate juice to the cask. It started out with a subtle, mildly bitter juicy sweetness before the pomegranate addition brought on a slightly sour, smooth haze over the beer. It finished dry with just a hint of hops and tasted every bit as good as it smelled. 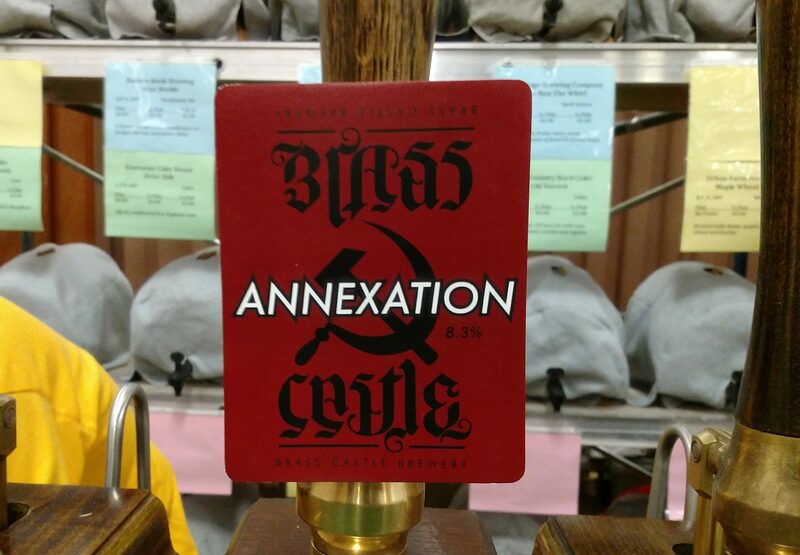 From the UK: Brass Castle Brewery (North Yorkshire, England) – Annexation: An 8.3%, gluten-free Russian Imperial Stout the brewers call “as smooth as the Volga and as bonkers as Putin.” This was crazy smooth for the style and was amazing on cask. A little bit sweet, a little bit creamy, a little bit boozy it also had some great chocolate and molasses tastes going on that I would love to get some more of. The fact that it also happens to be gluten-free is simply mind-blowing. This was a superlative brew in its own right, but for a GF beer it is completely unequaled in my experience. Honorable Mention: Fyne Ales (Cairndow, Scotland) – Highlander: A super drinkable 4.8% Amber Ale that perfectly balanced a lightly sweet malt backbone and a mild blend of ctirusy and earthy hops. It was one of my last beers of the evening and an excellent brew to unwind with. Once again I had a really great time at NERAX celebrating the joys of cask and drinking some amazing beer. Definitely check this event out if you can! The second of two four-packs I picked up at Idle Hands the other day, this was a welcomed sight following the news that their immensely popular Galaxy Four Seam is on an indefinite hiatus due to the brewery’s new hop contracts. Let’s see how this one compares. Description: The brewery took their popular Four Seam IPA and dry-hopped it with (surprise!) twice the usual amount of Citra. Appearance: It had a mostly golden, hazy straw-colored body with hints of amber lurking in the depths. A thin white lacing formed with the pour and stuck around for maybe half the glass. Smell: An absolutely amazing burst of juicy citrus and tropical fruits right out of the can with a hint of bitterness hanging just on the edges. Taste: Subtle tropical and citrus fruits upfront gradually gave way to a dank blend of earthy and piney hops. Mouthfeel: Medium-plus body with a touch below moderate carbonation. Hype: The previous Four Seam variant with Galaxy was quite popular and well-regarded, so I was very interested in giving this a try. Overall: I liked it well enough, but the taste unfortunately didn’t quite live up to the amazing aroma of this beer. I’d have no problems drinking this one again (indeed I almost assuredly will at some point), but I wouldn’t prioritize seeking it outside of the taproom. With a week of winter storms in our forecast, my wife and I stepped out the other day to make sure we had sufficient supplies for the house. Included (of course) in that outing was a stop at our local neighborhood brewery. I noticed earlier in the day that they had a couple of things of interest to me, in particular this big new stout that seemed perfectly suited for winter weather. 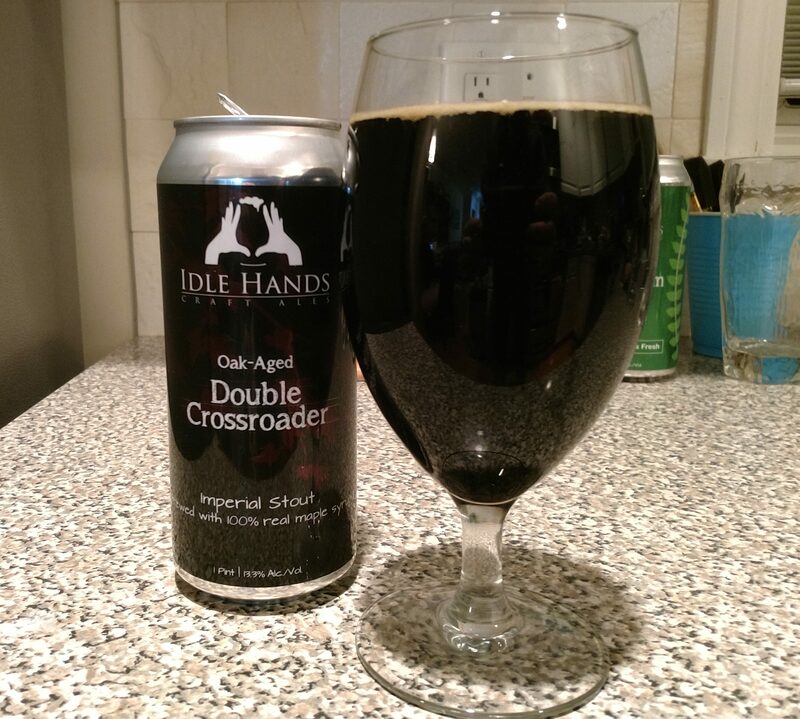 Description: A powered up version of the brewery’s Crossroader Imperial Stout brewed with brewed with maple syrup and aged on American toasted oak. The four-pack of cans cost $22. Appearance: Poured a dark brown/black body with a small amount of light tan lacing across the top of the glass. Smell: A subtle blend of boozy maple syrup, lightly roasted malts, and some oak influence. Taste: There was a whole lot of flavor to unpack with this one! I got intermingling tastes of dark malt, espresso, bittersweet chocolate, and maple on the front end before the brew came to a moderately warm finish that showed off the oak aging processing. Mouthfeel: Medium bodied with low carbonation. I was honestly a bit surprised this wasn’t a bit thicker, but that did not negatively impact my drinking experience. Hype: The base stout was well received when it came out a little while ago and they couldn’t have planned on releasing this at a better time. Idle Hands has also been pretty low-key in terms of drawing in the hardcores beer hunting crowd, but I was certainly excited about this one. Overall: Very, very good. The beer’s great blend of flavors combined with its nice, warming feeling made this one a winner in my book! Definitely a great choice for sitting back and watching the snow fall and well worth the money. When I saw this come out the day before Valentine’s Day I figured I should head out and grab a bottle. It seemed like something that might make for an appropriate beverage the next day, though little did I know at the time that this would end up being one of the most controversial beers I’ve reviewed to date! Description: Inspired by European drinking chocolates, this imperial stout was brewed with over 500 pounds of cocoa powder. More specs are available here. Appearance: Dark brown chocolate-like body with a thin, bubbly tan head. Smell: Faint aromas of dark chocolate. Taste: Big dark chocolate and cocoa powder flavors throughout. A creamy, more fudgy taste came through as the beer warmed up a bit, but really this was all about the cocoa. The finish was warm and strongly bittersweet, though that too mellowed a bit with time in the glass as mild sweeter notes began to appear as the beer went on. Mouthfeel: Creamy, medium-plus body with low carbonation. Hype: Highly elevated due to INTERNET DRAMA! 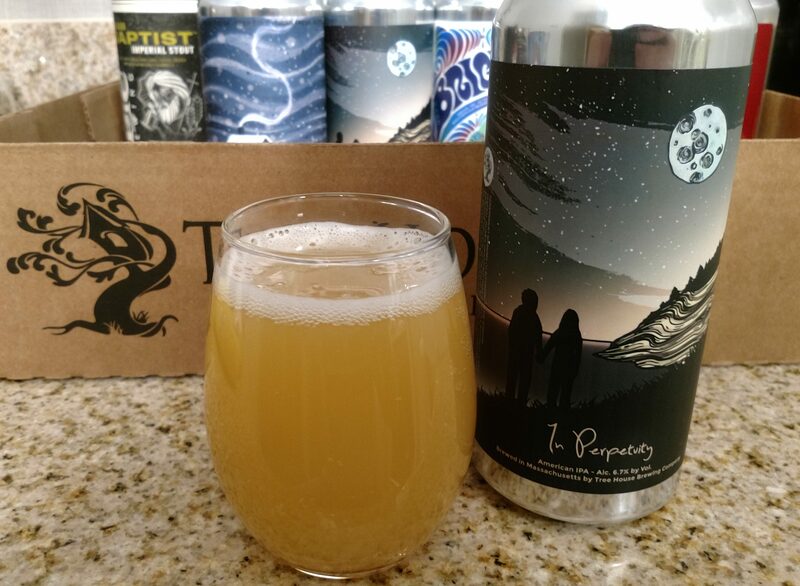 The one time darlings of the Boston beer scene, Trillium recently (and rightfully) received a lot of backlash surrounding some suspect compensation policies for their taproom employees. Despite making changes in response, their reputation took a big enough hit that some in the beer community now find it fashionable to hate on the brewery every chance they get. Combine this with recent unpopular changes in the fermentation profile of some core beers and a bad keg being tapped on release day and jilted fans did what people apparently do these days and took to social media to vent their outrage. Coming out in equal numbers, however, were not only the beer traders that flock to any Trillium release, but also a number of people offering rave reviews. I bought my bottle early in the day before most of this played out so I had no idea what to expect when I opened this up. Overall: As is often the case, the truth of this beer (at least according to my taste buds) was somewhere in between the extremes. The beer was good (and certainly nothing like the images from the bad keg that circulated) but I wouldn’t rank it among my favorite stouts from the brewery either. I found the finish a bit more intensely bittersweet than I typically like my chocolate and I thought it could have benefit from a slightly fuller mouthfeel, but I also had no problems drinking my share of it. Was this worth it as an $18 stout? Probably not, but given what prices are in my area I don’t feel like I totally got burned on this either. To each their own. Checking in with one last beer I picked up at Treehouse last month. I know I’ve posted a lot from them lately, but since this is what I’ve been drinking, this is what I have to post about. First world problems, for sure. Description: Brewed to celebrate “the notion that what is good and beloved will last forever,” this beer featured a “simple malt bill” and utilized Citra and Nelson hops. Appearance: It had a light, hazy pale yellow body with wisps of white foam up top. Smell: Tons of tropical fruit and a little bit of citrus juice burst right out of the can and continued on in the glass. Taste: Much like the smell, this offered up a super juicy blend of tropical fruits atop citrusy fruits and hop profits. It also had a very mild resinous, slightly spicy, finish with a bit of grain mixed in as well, but really the fruit juice elements of this are the story here. Mouthfeel: Medium-bodied with moderate carbonation. Hype: The second of two beers released on the day I happened to be at the brewery, I am going to assume this one also had something to do with the long line that had formed as well. Overall: Really good and a superlative example of the style. Tons of potential as a breakfast beer in place of your morning juice. As soon as I saw these cans posted by my local bottle shop I knew I had to review it. 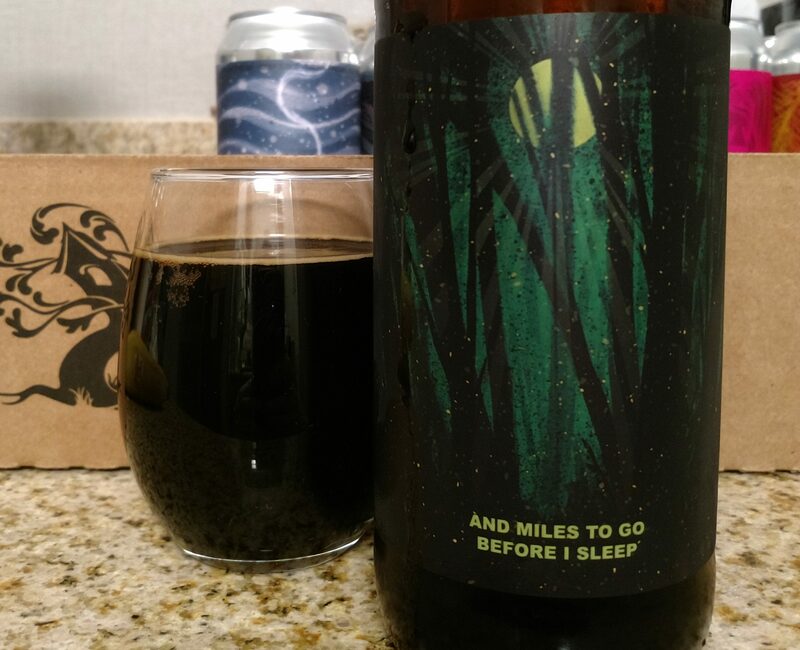 I don’t often find brews that cross over into my love of books, so I am going to jump at them every chance I get. Description: There’s not much info to be had on this one, but I did find some details here. It’s listed as a full bodied Baltic porter kept smooth by lager yeast and a long conditioning period. Appearance: Dark cola-brown with reddish hints on the pour that transitioned to looking more or less black in the glass. Wisps of off-white coating laced the top. Smell: Notes of leather and dark malts. Taste: It had a looming leather and tobacco-like presence presence throughout with notes of light roasted malts and toffee mixed in a various points along the way. Mouthfeel: Medium-thin body with low carbonation. 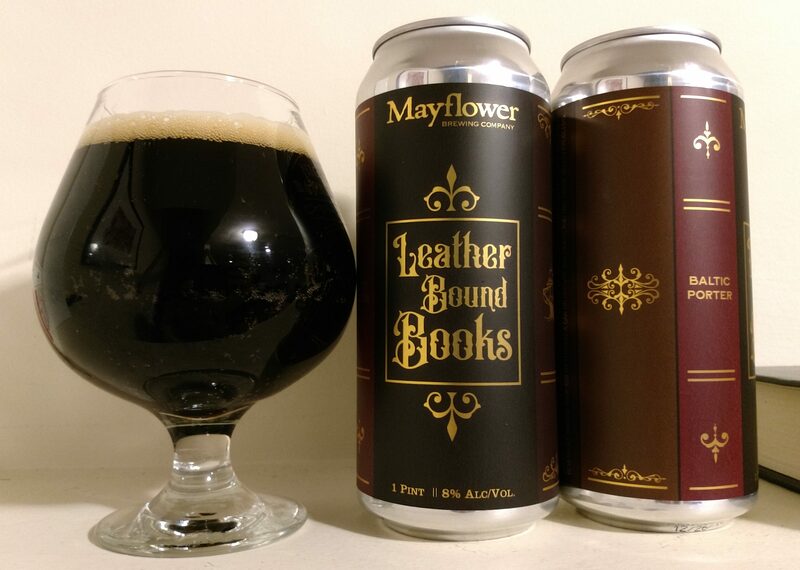 Hype: At this point I am well aware the dangers of buying a beer on name along, but I’m always up for trying something from the folks at Mayflower. They somehow fly under the radar locally despite consistently putting out some amazing brews. Overall: I have to say the taste, in good way, very much delivered upon the name. I enjoyed this brew even though it’s definitely a bit different than most of the beers I tend to gravitate towards. An interesting evening sipper, try this out if you’re in the mood for something a bit different. One of the other standouts among the goodies I picked up during my visit to Treehouse two weeks ago was this next stout. As an added bonus on this one, by sheer luck it happened to be released the day of our arrival so it was an unexpected surprise for sure. I guess we just had good timing! Description: Taking its name from a Robert Frost poem, this rich stout was brewed with “large additions” of chocolate and peanut butter. Appearance: Poured to a thick black body that settled into the glass beneath a thin layer of short-lived yet dense tan foam. Smell: A little bit of roast upfront with some sweetness lingering on in the end. Taste: Light notes of roasted malt upfront followed by moderate levels of creamy chocolate and peanut butter. It was a nice blend of flavors for sure, but it was a bit surprised they didn’t show up in reverse. Mouthfeel: Very thick body with low carbonation. Hype: There was quite a turnout at the brewery by the time we arrived on an early Friday afternoon (maybe an hour or so after opening), and based on social media responses I assume that this brew played a role in that. Overall: Very good, but perhaps not quite matching the hype and excitement (which after an hour in line is hard to do). Still, I was quite pleased with this and thought the $13 price tag was pretty reasonable (local beer prices being what they are) for what this was. My wife and I took advantage of my mom’s offer to babysit last Saturday and went out for our first proper “date night” in quite some time. 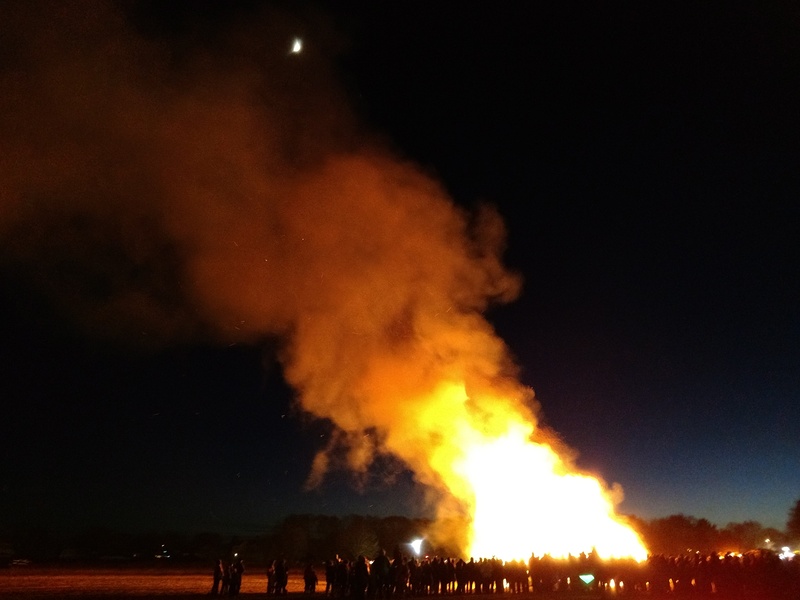 Our destination of choice was lovely Newbury, MA for the 8th Annual Christmas Tree Burn Fundraiser. Braving temperatures dropping below 20°F, we had an excellent time walking the farm, watching an ice sculptor, and, of course, taking in the giant bonfire that sent all the Christmas trees thrown away this year out in a blaze of glory. 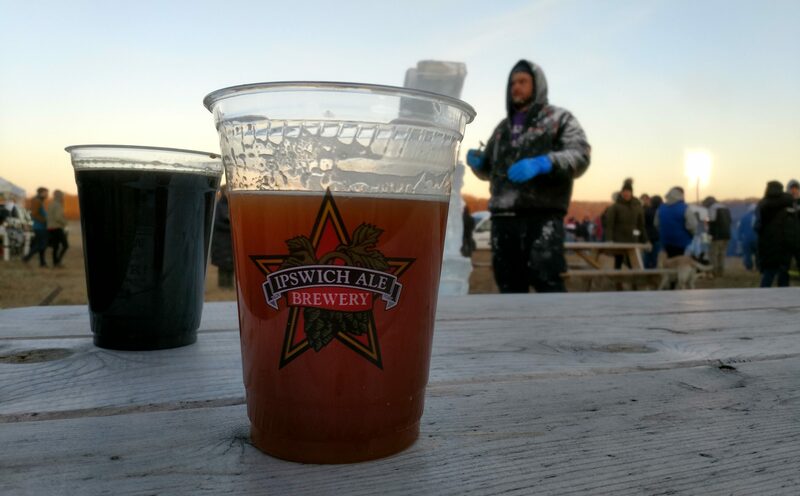 Another point of interest, particularly for me, was a beer called Defrost, a special release local favorite Ipswich Ale Brewery prepared specifically for the event. Description: Brewed for the event and to help fight the winter blues, the release notes promise a beer that balances “iconic German yeast flavors… against a complex malt base with notes of chocolate and dark fruit.” Proceeds of its sale go to benefit the Newbury Volunteer Fire Department. Appearance: Fresh off the draft lines of one of the brewery’s handy little tap mobiles, it poured an opaque caramel colored body with some light tan lacing spread out across the top. Smell: Crisp malts mixed with a slightly spicy, wheaty presence. Taste: Sweet bready malts upfront, followed by notes of dark fruit, wheat, and banana-like esters in the middle. A very subtle noble hop presence brought it all together with just the barest hint of spicy bitterness. Mouthfeel: Medium bodied with a slightly above moderate carbonation level. Hype: Relative to the beer scene in general I would say not much, but I was certainly interested in trying this out and the lines for beer suggested that I was not alone in this. Overall: A very flavorful brew that certainly did its part keeping me warm on a rather chilly evening. I had a couple of these that night and might even have a few more if it crosses my path again. As I mentioned in my introduction yesterday, my daily reviews the next two weeks will be a mix of winter and holiday themed beers. 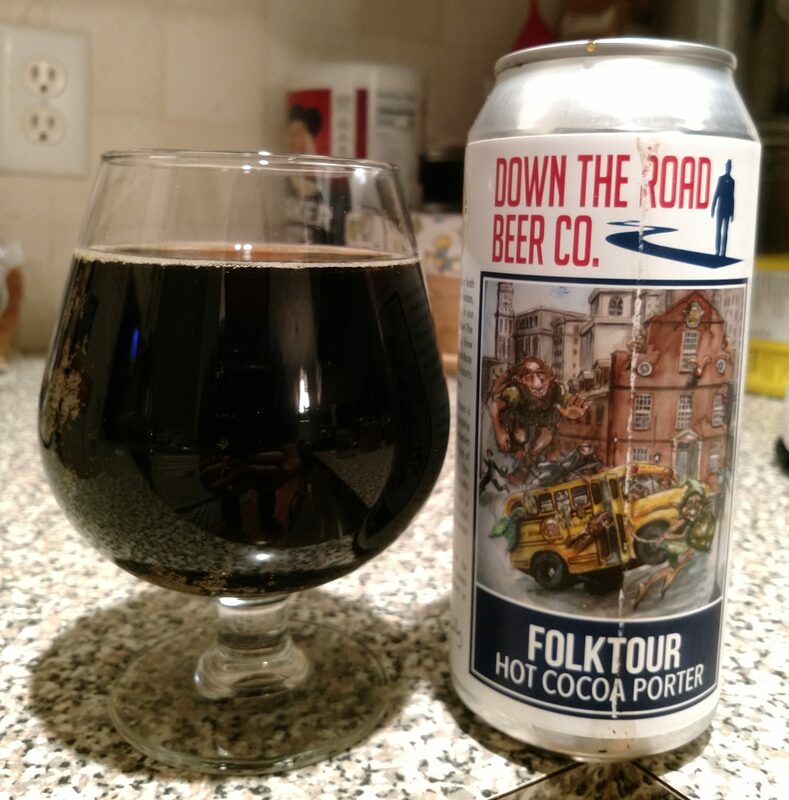 It’s been pretty cold in the Boston area lately, so finding this hot cocoa-inspired porter really got me excited. Description: Per their release, this beer was created to celebrate the friendship between the brewery and the folks at City Brew Tours. I couldn’t find anything on the brewing specs, but it is described there as featuring notes of sweet chocolate, vanilla, and dark malt. Appearance: Poured a deep, black body with a thin coating of white bubbles that never quite came together to form a head. Smell: Inviting aromas of sweet cream, fudge, and dark malts. Taste: It started out with hints of cream, light roasted coffee, and bitter chocolate. From there it took on a slightly yeasty presence before coming to a finish of bitter dark chocolate and roasted malts. While none of these flavors where particularly overpowering in any way, they never quite achieved a balance with one another either making the overall experience seem a bit inconsistent. Mouthfeel: Thin, slick body with low-level carbonation. Hype: Just my enthusiasm for the season. I like that this brewery is almost literally down the road from me, but I’ve had just as many misses from them as I have hits. Overall: I wasn’t a fan of this. As I mentioned above, the beer was particularly balanced and I felt like the tastes were kind of all over the place. 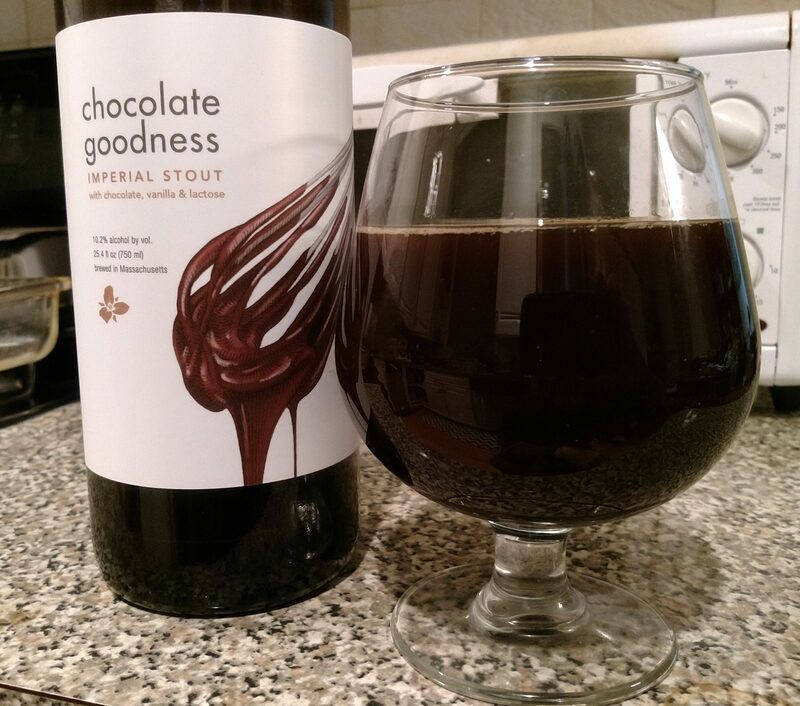 Not to pile on, but I feel like this missed its mark as a hot cocoa-inspired brew as what I imaged from that descriptions (sweet and chocolately) was very different from what I got (roasty and bitter). The smell was great, but unfortunately the rest of the beer didn’t live up to it. Hi again everybody! Sorry that I have been fairly quiet this November, but life has been pretty hectic lately and after all the blogging I did back in October I needed to step back for a bit. Anyway, I wanted to make sure I got this review up since this was a special beer for me. 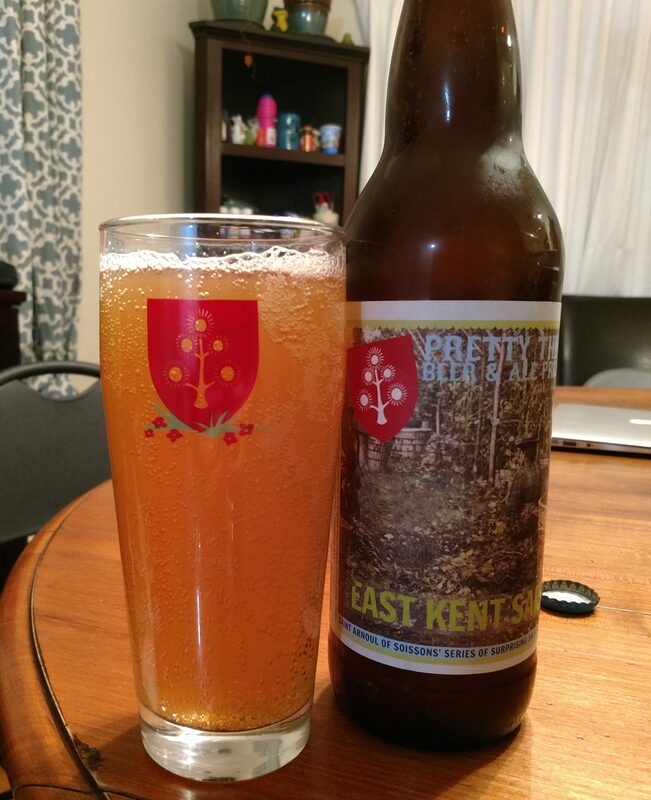 I said a little while ago that I had probably had my final beer from Pretty Things, but then some friends from out of state went and surprised me! Description: Bottled back in October 2015, this was brewed with pale malt, English ale yeast, and Whitbread Goldings hops. Appearance: It poured a cloudy yellow/light copper body that got topped off by a thin white foam. Smell: Sweet malts with some yeasty notes on the end. Taste: The sip began with sweet caramel malts. The sweetness then gave way to some mild yeasty notes and a mild floral bitterness. Mouthfeel: Just about medium-bodied with a consistent bubbly carbonation. Hype: High levels of nostalgia, though more for the brewery than this particular beer. Overall: While I think this might have shown some signs of age in terms of how the tastes all came together, I still found myself really enjoying this. Considering how well this 5.6% saison was tasting over three years after bottling, I really wish I had more of this one when it was still rolling off the bottling line.